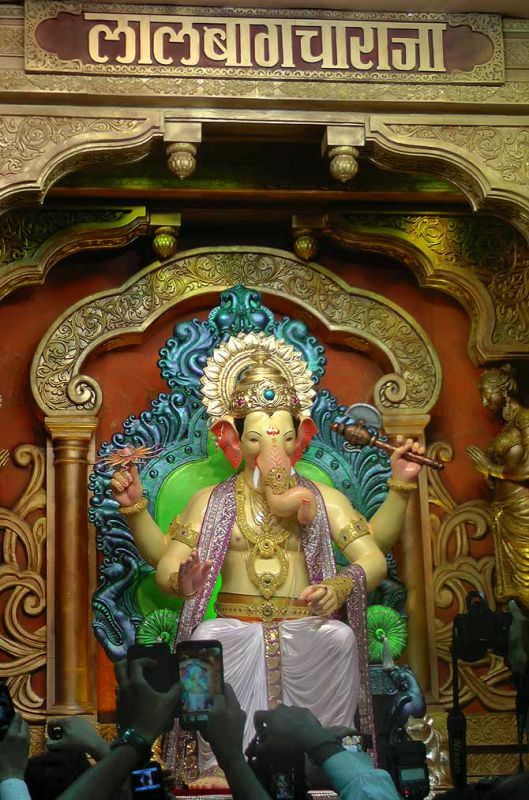 Most popular mandal in Mumbai, Lalbaugcha Raja, takes Rs 51 crore cover. The 10-day Ganesh Chaturthi festival set to begin from Friday has seen a bumper season for the insurance sector. Insurance officials said about Rs 480-500 crore (Rs 4.8 to 5 billion) worth of cover has been taken by mandals across Maharashtra. Last year, Ganpati puja organisers had taken Rs 400-420 crore (Rs 4-4.2 billion) worth of insurance coverage, which offers protection against damage to idol and pandal due to fire or other incidents, jewellery, personal accident for devotees, apart from insurance against terrorist attacks. GSB Seva Mandal Kings Circle has taken a cover of Rs 237 crore (Rs 2.37 billion) for the Ganesh festival. Satish Rama Nayak, Sr Trustee of the mandal, said that this includes an all risk policy for for gold and jewellery of Rs 16.9 crore (Rs 169 million). This mandal's Ganesh is called "gold ganpati" as it is covered with several kilograms of gold. The cover also includes public liability policy of Rs 20 crore (Rs 200 million), accident insurance for 1,989 people of Rs 10 lakh each. The total package also covers standard fire and special perils with a terrorism cover. GSB Seva Mandal had taken a coverage of Rs 258.9 crore (Rs 2.58 billion) from a nationalised general insurer last year. Like the previous year, the most popular Ganesh mandal, Lalbaugcha Raja, at Lalbaug in Mumbai, has been insured for Rs 51 crore (Rs 510 million) by New India Assurance. This includes coverage for the set, pandal, settings and electricals, apart from cover for third-party risks (prasad or edible offerings for incidents of poisoning). Further, this also includes accident insurance for officials, volunteers and residents. The insurance cover also includes protection for the gold and other valuables for the idol. Lalbaugcha Raja Sarvajanik Ganeshotsav Mandal officials said they have insured immersion activities. This policy worth Rs 15 crore (Rs 150 million) has been taken from Oriental India Insurance. Under this, if there is a death or disability due to any accident during immersion processions, a compensation to the kin of victims would be provided. The mandal officials said this would cover immersion-related incidents on all days of immersion, including second day, fifth day, seventh day, 10th day and 11th day and would also give protection against drowning-related accidents/deaths. Different mandals have different dates for immersion of the Ganesh idol. Similarly, Pune's Dagdusheth Ganpati temple, which has the highest footfalls during the festival, has taken a cover of Rs 40 lakh for the mandap and decorations around it and has been taken for a one-month period. Officials said they are also taking a cover of Rs 50 crore (Rs 500 million) for its devotees and it may even extend beyond the annual Ganpati festivities. Another popular mandal Andhericharaja has secured a cover of Rs 5.98 crore (Rs 59.8 million) from National Insurance. This includes the mukut (crown) of 100 gram, apart from the 38 kg silver items, decorations and will have fire and terrorist insurance covers. The general manager in a public general insurance company said the number of Ganesh mandals taking insurance had seen a 30-40 per cent rise. “While the sum assured might not be very high, mandals usually have an average cover of Rs 50 lakh to Rs 1 crore (Rs 10 million). We are now seeing smaller mandals also have taken basic covers for fire, theft and personal accident, since the footfalls have increased across mandals,” said the official. For these insurance policies, the premium can range between a few thousand and several lakhs depending on the size of the coverage. For a coverage of Rs 15 crore, the premium could be Rs 12-13 lakh, though it is on for a period of 10 days. The Ganesh festival will be celebrated from September 17 to 27.